Further to OSLC + POXProfile post, RPE 2.1 with CLM 6.0.2 simplifies the data source configuration; especially while configuring dynamic data source for traceability reports. 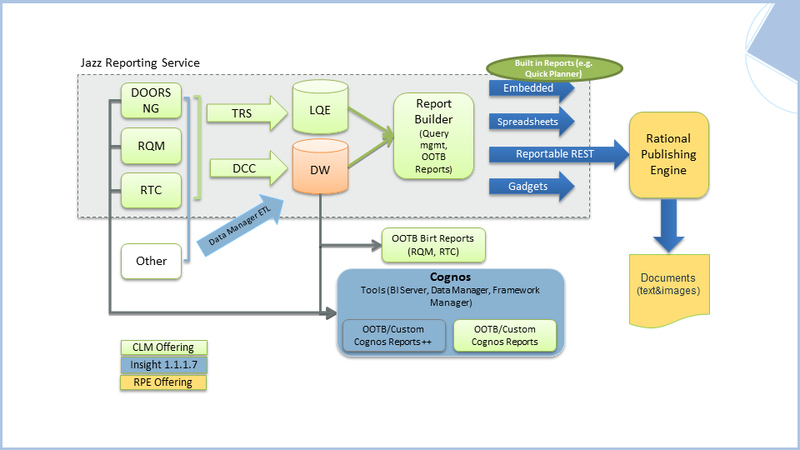 This is how JRS, Insight and RPE fit together to provide reporting capabilities for CLM and more. 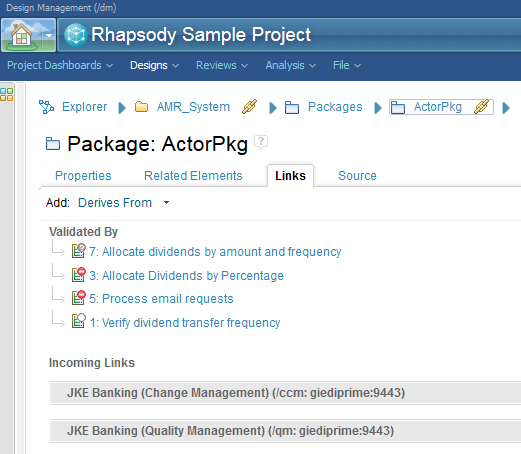 The JRS and RPE combination offers excellent design usability and runtime performance for any report that involves traceability/data aggregation. This is a workshop from 2013 but it’s still correct and provides valuable information for how CLM REST APIs and especially the data linking works. The exercises are well structured and show you the actions sequence used to build most CLM templates. This is a guest post by my colleague Subramanya Pilar from the RPE FVT team. The example template associated with this article, rtcWorkitemHistoryWithMetadata.dta, is available in the RPE Community Template Library. Rational Publishing Engine provides functionality to configure data source metadata so that when RPE report is consumed by point product, it can understand how to configure the data sources. This capability enables report designers to provide users with a list of options to choose from, instead of manually entering the URI. Below are the steps to configure a template’s metadata so that RPE template can be executed from within Rational Team Concert. Open the template in RPE Studio. In Outline view, right click on the data source that needs to be configured and select “Edit Configuration Metadata”. Usually, this data source is the parent data source which is not dynamically configured and the name does not start with “_”. There are 4 fields in “Edit Configuration Metadata…” window. “Request URL” – the URL that RPE will request the data to show to the user. There are pre-defined variables that can be used in this field that RTC will recognize. You cannot use these values if configuring the report from standalone RPE. “Type” restricts the format of user input. “Identifier”- XPath expression that selects the data RPE/RTC will use to configure the report. The values of this attribute must be Reportable REST URLs . “Display” – XPath expression that selects the data RPE/RTC will show the user. NOTE: you can drag and drop attribute from Data Source View into the identifier and display fields. If ‘Request URL’ isn’t set, then user has to manually input the data source value when executing the report. If ‘Request URL’ is set, and ‘Identifier’ field is not set, the resolved value of ‘Request URL’ will be used for report generation. If both ‘Request URL’ and ‘Identifier’ fields are set, a GET request to the resolved Request URL is made, then ‘Identifier’ and ‘Display’ XPath expressions are evaluated on the server response and a list is shown to user to choose from. The values matching ‘Display’ expression are shown in the list and the corresponding value of ‘Identifier’ is set as data source URI. In this example the user is provided with a list showing the id and summary for all the workItems . Once user selects a workItem the reportable URL of the chosen WorkItem is used to configure the document generation. NOTE: for RTC the @href attribute cannot be used in Identifier field because the URL it holds is not a Reportable REST URL. the document is self contained, you can transfer the documents with embedded objects to other computers or mail them without breaking any link. you can edit the embedded objects without changing the content of the source. embedded objects can be edited without having to work in a separate window. 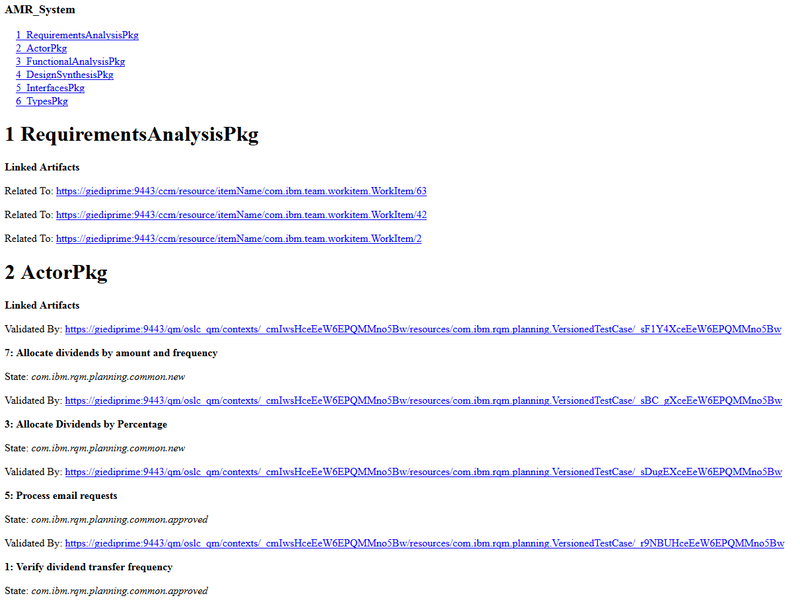 Rational Publishing Engine supports creating such documents. The attachment can be of any format supported by Microsoft Word for embedding .xls, .pdf, .doc, .docx are examples of such documents. Continuing the Assemble traceability documents from reusable building blocks I want now to add QM data in the mix. I will be using the same DM model as a starting point and I will follow links to QM Test Cases. As you read this I recommend also going through Geoff Rosenthal’s the excellent Rational solution for Collaborative Lifecycle Management Traceability Templates with Rational Publishing Engine tutorial. The artefacts for this tutorial are available on the Unclassified & Cross Domain Templates section of the RPE Wiki Community at #15 DM to CLM Traceability. Getting the DM link information is already covered in Assemble traceability documents from reusable building blocks so I will skip it here. This article starts from the point where you have your DM and DM link data in place in your template. But before I go there I want to explain how QM linking works and what are the various schemas you will encounter in the process. For the example I am presenting you can get these URLs from the link page of the DM artifact. And if you access these URLs from a tool like Poster and specify “application/xml” for the “accept” header you can see the data available. One thing you will notice is that even though the data is not in the form you are used to when reporting on QM with RPE which is the QM’s Reportable REST API. 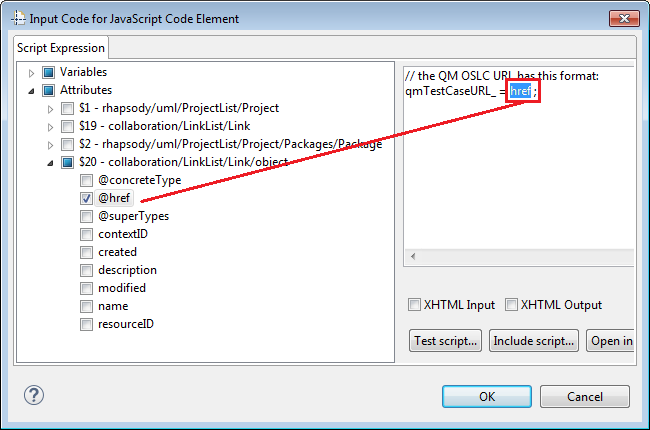 Unlike DNG there is no way to convert from the RQM OSLC v2 URL to the Reportable REST URL but for QM the OSLC representation of the QM artifact contains the link to the RQM Reportable REST URL. So to get from the OSLC URL to the Reportable REST URL you firsy need to access the OSLC resource, read the Reportable REST URL and then accesses the data there. Make a test run to verify all the pieces fit together. Just like with the RTC example you only need to specify the entry point and credentials for accessing the DM UML project. NOTE: You will need to replace the QM schema from my snippet with your particular QM schema so that you can use the custom attributes defined in your particular QM instance. 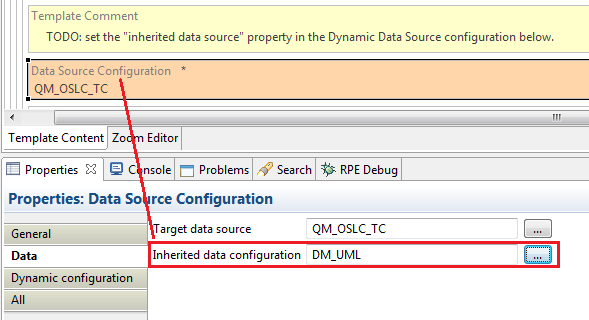 You now have 2 RPE snippets for accessing RTC and QM linked data that you can reuse in your traceability documents. I recommend evaluating your existing templates to identify other sections in your templates that you use on a regular basis and transform them in reusable snippets. The above is the outline of any 2 source traceability report and steps 2 and 3 are almost identical for all reports so they can be packaged as blocks to be reused as needed. To show this I have created a document with DM and RTC data. The artifacts I use in my example are available on the Unclassified & Cross Domain Templates section of the RPE Wiki Community at #15 DM to CLM Traceability.